At last! and it only took me three hours to write up the pattern... so much faster than fiction. Unless you count all the time I spent figuring out the stitches and then actually making it, and I won't, because then I would feel even worse about not making headway on my novel. But back to the rivet band. 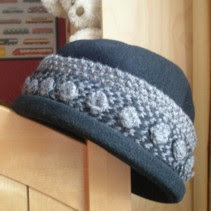 It's not a hat, but it's making my most sensible hat a lot more sensational and what else is this blog for, after all? You can also make it shorter and wear it as an earwarmer, or just lift the pattern to use for the border of a cardi or a felted purse, which I think I must try myself some time. In other interesting rivet news, these are my very first bobbles, and I love them--they're so flat and non-popcorny. Claire, I used a worsted weight yarn at 9 wraps per inch, I hope this helps!! Stunning! Gorgeous! You've outdone yourself... just beautiful!